Welcome to the North Cedar Alumni page. No matter where your journey in life has taken you, we welcome you home to reconnect with the North Cedar Community School District. We invite you to renew friendships and expand your network as you make new acquaintances. We hope you will enjoy the opportunity to stay informed and stay in touch! Do you know of a North Cedar Senior High School graduate who has made a significant contribution to society? If so, we invite you to nominate them for one of our awards by completing and submitting the form found at the side of this page. Nominees for the North Cedar Alumni awards must be an alum of North Cedar Senior High School or one of the former district high schools that make up North Cedar (Clarence HS, Lowden HS, Mechanicsville HS, Stanwood HS, Clarence-Lowden HS, Lincoln Community HS, or North Cedar Senior HS), and he or she must be at least 28 years of age. We have five different awards for five deserving people, and we can't wait to see whom you think these awards should recognize! Given to alumni who have earned recognition for their achievements and contributions in their professional life. Given to alumni for specific and meritorious service to the NCCSD or any other not for-profit organization. Awarded to alumni with exceptional accomplishment in athletics while attending high school. Awarded to alumni with exceptional accomplishment in the fine arts while attending high school. Major roles in theater productions, solos, etc. 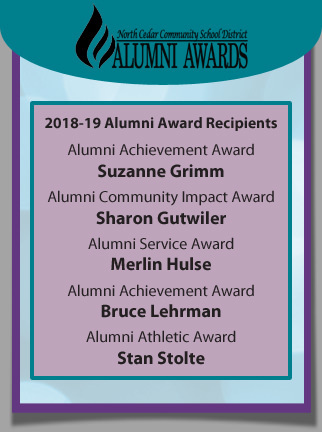 Awarded to alumni who should be rewarded for their service impact on the North Cedar Community. Note: If you nominate someone this year, and we do not select him/her, we will retain the nomination for consideration for two additional years. Check back for news about our events!